James Thurber wrote a piece about the life and death of his cat. It was thoughtful, sensitive, and moving. I have been looking for it since my cat, Dusty, began his decline and death. I have not found it. If you happen to know which of Thurber's many books contain that piece, you could leave a comment at the end of this one. I would consider it a great favor. Thurber always considered himself a dog person. Until I became acquainted with our neighbor's cat Jasmine, I was a dog person myself. I, like many people, considered cats cool and standoffish. Although, when around many other people's cats, cats that were described as afraid of strangers, I had no trouble making friends with them. Those people would seem amazed, saying "Oh, He never lets strangers pet him." They could conclude I must be a good person if their cat would allow me to approach them. I shall leave that decision to the cats. Wife and I would sit on our small porch and have a glass of wine in the evening. Jasmine would come to visit. She would bring us live bugs and snakes as presents. We eventually let her in the house, where she made herself at home, napping on our bed, or, I have a picture, in my partly open underwear drawer. Jasmine always seemed to have an air of dainty sophistication. 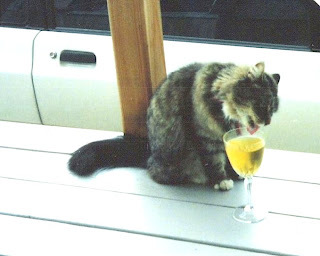 If offered a glass of wine, she would sit beside it, sniff, as any good wine connoisseur, dip her paw, and lick it. I always had the impression that she would have swirled the wine around in the glass, had she been able. After a time, the neighbors locked Jasmine inside so that she would not 'bother' us. I think they were jealous of the affection between Jasmine and us. Wife and I became lonely in the evenings, with the loss of our furry friend. Wife had owned several cats. My family had owned one briefly when I was very small. I remember his demise came after he jumped onto the supper table and helped himself to the salmon there. After some discussion we decided to get a cat of our own. Wife said the males were more active and entertaining. At the pet store in the mall, the local vet had left several kittens to be adopted. For the miserly sum of twenty dollars, we could have our choice. All but one of the kittens were inactive. The active one took an interest in me and I picked him up. I laid him on my arm and walked about the store, idly petting him. After a bit, Wife says, "Look, he has fallen asleep on your arm." It was so. Because of a small gray smudge on his chin, we decided, at wife's suggestion, to call him Dusty. From that moment, Dusty was my cat. 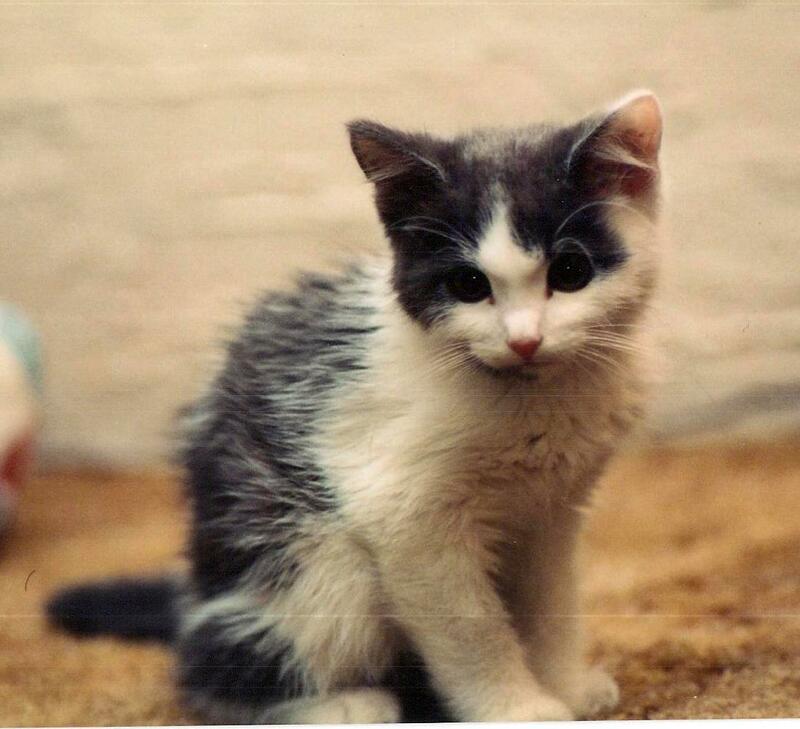 Dusty was dark gray and white. He had an expressive face. Wife says he and I look exactly alike when we are angry. Our faces puff up. (after one unpleasant marriage, I learned speaking when I am angry, has no useful effect. My face does puff up from holding anger in.) He also gave the impression of being extra intelligent and somewhat clairvoyant. I owned a gun store at the time and was usually awakened by an alarm clock at 6am. From an early age Dusty developed a very loud yowl and soon relieved the clock of its duties. He took it upon himself to wake everyone at 6 am. (or 5:30, just to be sure we were up on time) He stuck to that duty faithfully for 19 years... giving it up only at the end. While I miss my Dusty, I do not miss being awakened every day at 6 am. Dusty exhibited other time telling skills. When we let him outside, he always came home at our regular bedtime of 9pm. Not 8:55; not 9:05; 9:00 sharp Daylight savings time. We gave him a treat when he came in. In later years, when he no longer wandered the streets, he still expected his treat at 9pm, 8pm standard time. While treat time was fixed with the universe, he seemed to catch on to government time a day or so after the change, for the purposes of his alarm duties. We got Dusty in the fall, in Colorado. We kept the mobile home cooler to save on utilities. At night I would take Dusty protected by my left arm, under the covers. He developed the habit of sleeping under the covers in cool weather. After the bed was made in the morning, it would develop a cat sized lump. Cats, as you may know, are not inclined to come when called, unless it pleases them. Once, when we took the cats (We acquired Sandy a couple of years after Dusty) camping in the mountains. Dusty seemed to have disappeared from the camper. After a half hour of frantically running around in the woods calling for him, I returned to the camper to find him casually sitting on the bed. He had apparently gone to nap under the unmade covers. Our frantic running around and yelling eventually moved him into showing himself. Wife and I like to travel, We would leave Dusty with enough food and water for a week and go away for 3-5 days. Dusty seemed irritated at being left alone. Once, we were gone longer than usual. On returning we found Dusty had invented his own entertainment in our absence. He had jumped onto the top of the washer and dryer and reduced 48 rolls of Charmine toilet paper, stored on the shelf above, to quarter sized pieces. It filled the 20 foot long hall from living room to bedroom, waist deep, with torn up Charmine. Dusty seemed pleased with his work. We decided Dusty would be happier with a companion. The vet had an orange and white kitten he had been raising, because the mother had been killed. We called him Sandy. Sandy and Dusty became great friends. They both grew to become large, handsome cats. They always looked out for one another. While Sandy was still a small kitten, he was exploring the hide-a-bed sofa and got folded up in it when it was put away. Dusty sat on the sofa and yowled until Wife came to check on him. There, she heard Sandy's weak little mew from inside the sofa and let him out. From then on, if we needed to find one of the cats, we would simply ask the other "Where is Dusty?" or "Where is Sandy?" and each would lead us to the other... unless we were going to the vet. They apparently knew when we were about to take them to the vet and neither would betray the other. In our second house in Wyoming, Dusty went missing for an extended time. As we got more concerned we asked Sandy "Where is Dusty? ", "Go find Dusty." Sandy walked over to the stairs walked up to the fourth step and sat down. No amount of coaxing would get him to move further. His face had a "What the hell do you want from me, look?" Eventually we noticed Sandy was sitting above the door to the under the stairs storage area. When we opened that door, Dusty came strolling out. He had been trapped there when we were cleaning the area earlier. A short time after we got Dusty, we took him with us to visit Sister. On the way back home we decided to stop at the mall. It was quite cold outside but I did not want to take the kitten into the mall. I took a heavy jacket with a fake fur lining and wrapped him in it. He started to crawl out. I put him back, saying "Dusty Boy, this is an IQ test. If you crawl out again you will get very cold." When we came back an hour later he was still buried deep in the jacket. While Dusty was still a kitten, we would take him to the store with us. In cold weather he rode inside my jacket. We let him out to roam at will inside the store. He would climb in. out, and under the display cabinets exploring the store. (At the end of the day he was plenty dusty.) He would lay on the counter tops and absorb the attention of my customers. For a time. One night the Schwann man was making his monthly delivery of ice cream. I had put Dusty on my shoulder. When the man had delivered his bill, and was waiting for Wife to write his check, he reached for Dusty. Apparently his quick hand motion frightened the kitten and Dusty fell or jumped to the floor. From that time on he strictly avoided any man with a billed hat, for several years that included me. Because most of my customers wore billed hats, Dusty spent his days in hiding in the store. It became harder and harder to find him at the end of the day. Fearing the cat would eventually find a place from which he could not be extracted, we decided to leave Dusty at the mobile home, during the day. He seemed to enjoy his new found freedom. He became a regular outside cat with inside privileges. He energetically defended his home ground from all comers. Unfortunately Dusty was courageous but not a good fighter. He frequently came home with scratches on his face and ears. One of his main antagonists was Jasmine, who had somehow won her freedom. Later, Jasmine's owners bought an expensive cat for breeding purposes. Then they took their perfectly healthy cat and put her down . It was a sad day at our house. Dusty was less concerned. I am told cats are suppose to go nuts over catnip. Dusty liked his crushed into powder, so he could eat it. You will see video of cats rolling in catnip. Dusty never did. He just ate it. Toys were no more attractive if I put catnip in them. He did love toys with bells. One of his first was made to look like a mouse. It had a bell attached. Dusty would toss it in the air, bat it around with his paws, and chase it as it flew across the room. In the end it was only a small scrap of gray felt with a bell attached. Dusty seemed to know when he was in trouble. He was quite creative in finding and using hidey holes. Any out of the way, cat-sized space would become a place to hide and nap. When he was in trouble I would search him out. He would run to another. When I was closing in for good he began running to our bed and sitting on the corner on my side. I decided if there was a real emergency this would be a good habit. I would chase him from place to place, but if he got to the corner of the bed I would sit near him and talk to him but never touch him. He eventually caught on. The challenge was to catch him before he got to the bed or ambush him after he jumped down. Wife noticed he always ran to the corner of the bed. She would chase him there and grab him. He stopped using that as his safe spot. One day I was sitting at the kitchen table. Dusty was sitting at my feet. A friend was also there. Dusty looked up at me and gave a big yawn. I looked at him and gave a big yawn. He looked at me and closed both eyes for a second then opened them again. I copied him. He sat there for several seconds looking at me. I could tell he was thinking. Suddenly, he livens up, lifts his head and perks his ears, then flicks them... the right ear to the right and the left ear to the left. He looks at me as if to say. "OK, copy that smarty." He got a satisfied smile on his face and laid back down, knowing he had won that contest. When I was seated, Dusty frequently climbed into my lap. He made himself comfortable and stayed until he thought of something else he had rather do. He would also get into Wife's lap, especially when she would use the computer. If I came into the room, he would hastily jump down, as if he were caught being unfaithful. When Dusty was not napping, his favorite spot was at a window watching the world go by. He and Sandy would sit for hours watching birds, bugs, and people. During his last few months, Dusty was unable to climb into a window. In his last days, I fixed his spot in the window and set him in it. He would manage to climb down when he wanted to nap. Wife and I were not very consistent in grooming our cats. After Sandy's death, I began the habit of brushing Dusty each morning after my shower, or morning constitutional. If he napped and missed his brushing, he would go to his spot and whine until I came and did his brushing. He then tried to get two brushings a day by going to his brushing spot and whining. If he had already been brushed, I would pick him up, put him on the bed, and give him a brief pat on the head. During the brushing times, wife would sometimes say, if she died, she wanted to come back as my cat. 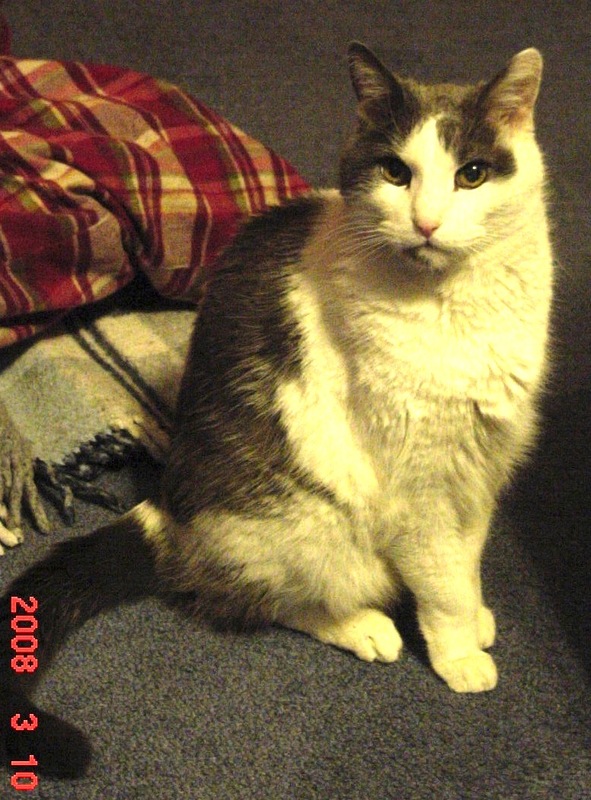 Dusty's decline began with the death of his friend and companion of 13 years. ( I shall tell of Sandy's life and death in a later blog) He began to eat less and lose weight. After a year or so he had gone from a normal, slightly overweight 16 pounds down to a more normal 12 pound. The next year or so he was down to 9 pounds. He continued to lose weight. Wife and I had started taking him to the vet when we went traveling. This really made him mad. For a week after I brought him home, he would wake us three or four times during the night, with his loud yowls. We took a cruise in May and were gone for three weeks. After this trip, when I picked Dusty up from the vet I could see he had stopped grooming himself. He was under 8 pounds. The vet suggested we feed him canned food. (See 78% moisture blog). As the Summer wore on Dusty went from thin to bony to skeletal. He lost interest in treats, catnip, and brushings. I had always hoped he would die peacefully in his sleep. But, he was tough and determined to keep on living. On a Monday I found him lying by his water bowl. He could no longer walk. He would not eat. I knew his time had come. On Thursday the local vet has half day office hours a couple of doors down from our home. We decided that would be the time. This vet was a stranger and I wanted Dusty, who was always afraid of his vet, not to know what was happening. On Thursday afternoon, wife walked to the vet and invited her to come to our house. The vet brought her assistant. The vet was calm, I was crying; Wife was crying; the vets assistant was crying. I held Dusty while she injected a clear liguid into his foreleg. Within a few seconds she announced "He is gone" and his head, which he had bravely held high, slipped to the side. Rob, your story about Dusty is so poignant, and I am sorry about your loss. Nothing compares to the unconditional love a pet gives you and having to make that decision to let them go, is incredibly hard.